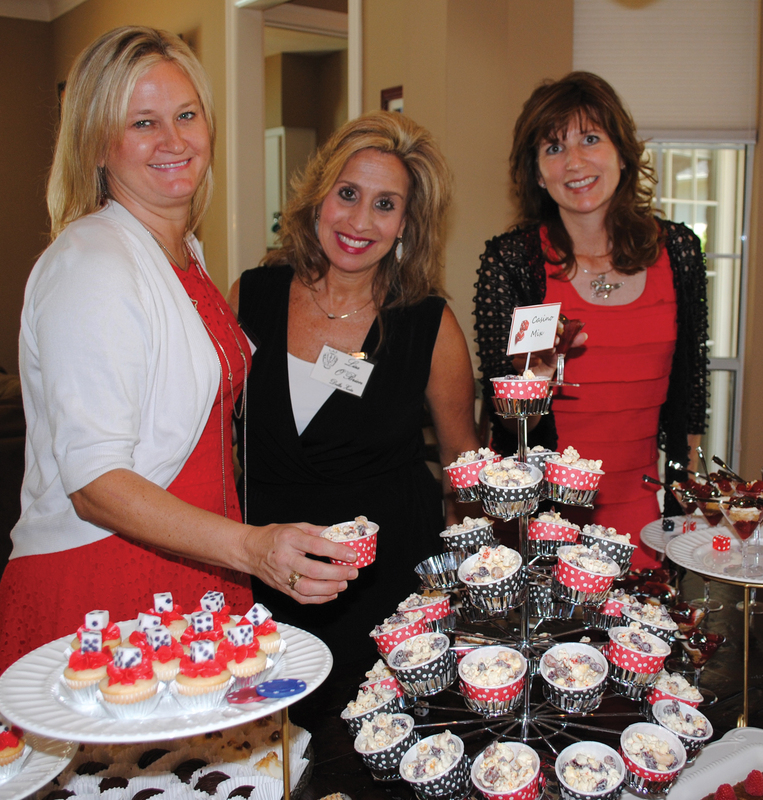 Hostess Stacy Bush Lyon, and Panhellenic Fall Friendship Tea Co-Chairmen, Lisa O’Brien and Ondi Lyon, from left, get all the desserts in place as the crowd begins arriving for the popular annual event. AS HAS BEEN the custom for many years, Clear Lake Panhellenic members launched the Bay Area’s fall social season with their annual Fall Friendship Tea. Stacy Bush Lyon was hostess at her new Bay Oaks Home in Clear Lake Sept. 13 with Panhellenic President Kay Lee Benoit and Vice Presidents Rikie Bowker, Jill Reason and Ellen King welcoming the many members who dropped by during the afternoon. Some of those you might have spotted in the crowd were Kim Barker, Peggy Clause, Diane Overman, Laurie Vaughn, Ann Gay, Kathie Wylie, Lisa O’Brien, Ondi Lyon, Sue Broughton, Karen McCorkle, Judie Ferguson, Jo Nell Hunter, Sheryl Williams, Ruth Beecher, Linda Kmjecik, Annette Dwyer, Ann Brady, Karen Malkey, Karen Douglass, Dewanna Norris and Judge Holly Williamson. 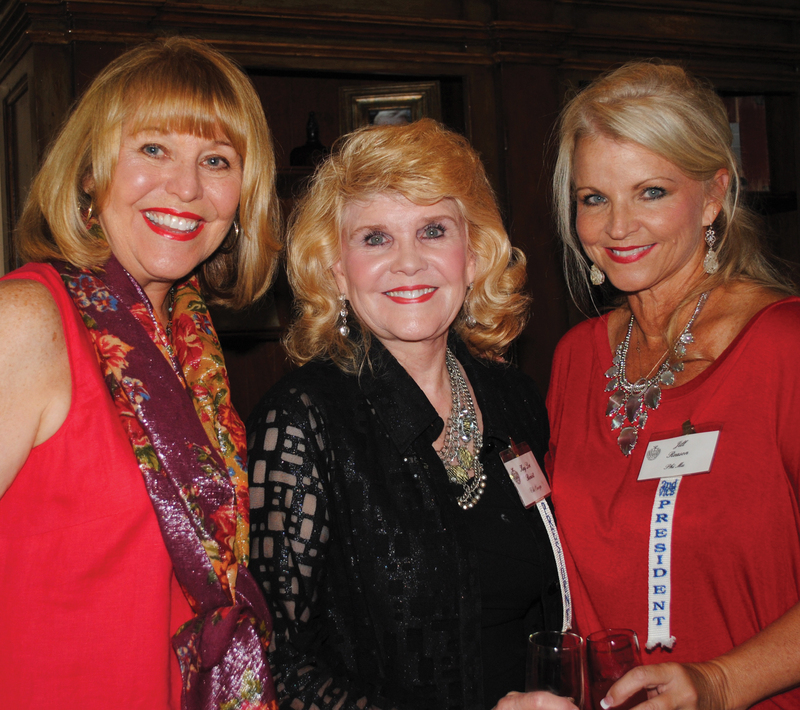 Ellen King and Karen Weber told of their plans for Panhellenic’s “Glamour and Glitz – Vegas Style” big fall fashion show Friday, Nov. 6, at South Shore Harbour Resort in League City. No ticket? Better hurry or you’ll miss all the fun. Fashion guru Lenny Matuszewski has been inked as producer of the show, and Ellen says we’ll once again be amazed at Lenny’s ability to pick the perfect runway fashions from Dillard’s for the show. Fashion show proceeds benefit the Crawford-Zbanek Scholarship Foundation, which awards scholarships to women from local high schools attending Texas universities. Reservations are $75 for general seating and $100 for a runway seat. For information on seating, email Karen McCorkle at panhellenicreservations@gmail.com or call her at 713-582-5884. Seating is limited, so make your reservations early, she said. Jackie Daley, Virginia Hosea, Betsy Salbilla and Ann Brady, from left, stop for a photo as they arrive at Bay Oaks for the BOWA style show luncheon. 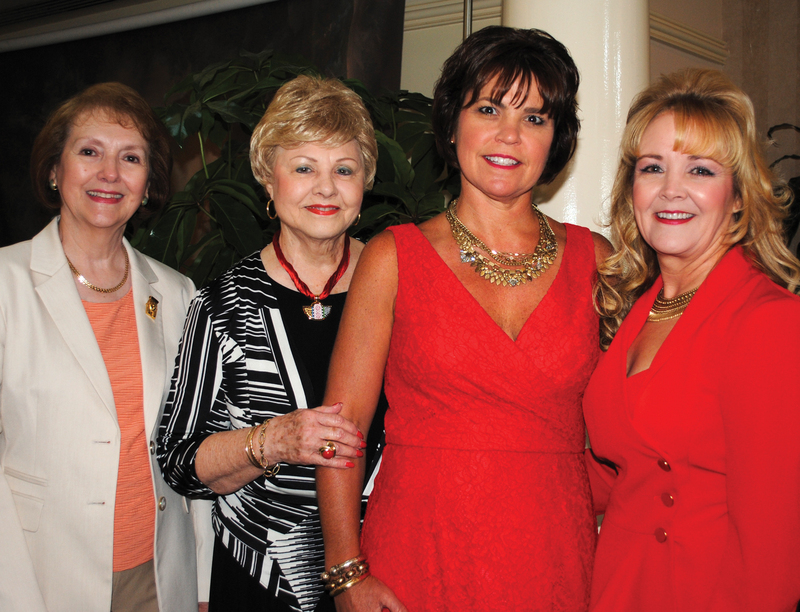 TWO DAYS LATER on Sept. 15, Bay Oaks Country Club Women’s Association members got the season underway with their annual Fall Fashion Show Luncheon. BOWA Vice Presidents Becky Hensley and Cambry Rogers chaired the event which included fall fashions from The Clotheshorse in League City – modeled by a number of pretty models, including Karen Reed, Janet Greenwood, Mary Colombo, Lea Bodie, Sue Broughton, Jody Schnabel, Tia Neyman, Emmeline Dodd, Judy Ferguson, Tia Neyman, Melissa McKinnie and Sarabeth McClintock. Among the smiling faces we spotted at the always fun event were, Jackie Daley, Ann Brady, Pam Ploss, Carol Bobo, Diane Konick, Kay Lee Benoit, Judy Raiford, Judie Ferguson, Sharon Dillard, Joan Wade, Susan Franklin, Glenna Crist and Ebby Creden — many catching up on each other’s summer news and all abuzz over the upcoming fashion show. Jodie Schnabel, left, and Tori Buttle look for their table at the Bay Oaks Women’s Association style show luncheon. As they mingled with the crowd, President Sue Broughton and Hospitality Committee members Ann Dooley, Angela Swint and Kay Lee Benoit were busy welcoming Jenny Frantz, Lisa O’Brien, Mary Smith, Diane Overman, Betsy Salbilla, Gayle Beaty, Gloria Wong, Ruth Beecher, Joy and Jill Smitherman, Sharon Christman, Betty Woodhouse, Donna Crenweige, Lucille Terraso, Quaisra Shah, Jodi Schnabel, Angela Bivens, Badiha Nassar, Joy Muniz, Norma Ogletree, Katherine Kiesselhorst, Priscilla Ennis and Yvonne Perrin. Along with Jordin Nolan Kruse, Janice Gornto, Lynn Smith, Bobbie Moutz, Trisha Gunn, Cynthia Villareal, Kathy and Linda Costanza, Margaret Vail, Allyson Jackson, Linda Herzfeld, Kim Steele, Virginia Hosea, Leigh Meza, Amy Roppolo, Peggy Sturiale, Becky Bryan, Julie Zamarripa, Danele Buehler, Priscilla Fletcher, Suzanne Sparks, Jo Nell Hunter, Tonia Wooldrige, Fran Gentry, Martha Kaminsky, Jean Hays, Patrice Sallans, Suzanne Leatherman, Sue Laabs, Marilyn Lunney, Delores Hoover, Stacy Lyon, Sarah Beth McClintock, Linda Kelly, Tia Neyman, Sharon Phelps, Kimberly Weathers, Barbara Spencer and Carole Murphy.